HellBound Books has delivered an attractive and very professional product. The cover art is perfect, the font size is great, and I am pleased to see that the book was printed in America. Inside there are thirteen (a coincidence? I think not) tales of dark destiny for your reading pleasure. The first story in the book, “Crawlspace,” sets the tone of what to expect from Mellon’s writing. A teenage boy has been acting up and making life hell for his mother, so she sends him over to Old Lady Ennis for some community service. Unfortunately the young man is not on his best behavior and a conflict ensues. Who will win this battle? 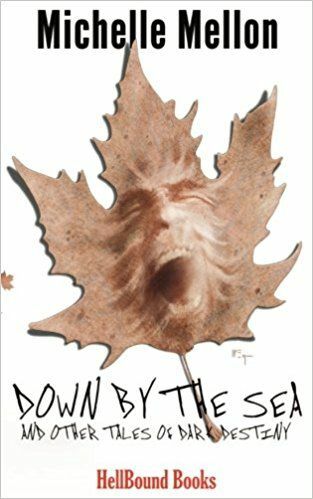 “Down by the Sea,” the book’s title story, is a unique tale told by a young woman who is part of a special legacy that connects her family to the sea and an ancient otherworldly creature. She remembers days spent with her grandfather in a unique shelter while holding a sort of vigil. At the time she didn’t even know what she was waiting for. But her father did. The thing from the sea is massive, like the ancient ones that so many Lovecraft stories feature, but the woman has a plan to stop it. The question is, will her sacrifice serve the purpose? Speaking of creatures, in “Fear of the Darkness,” Christine is a woman who’s got it all going her way. She’s a business powerhouse, has good ties with her family, and is happily married. So life is great! Well…almost. See, Christine has just one problem, but it’s a real doozy. You might even say it rules her life, because everything has to be planned around it. Yep! Christine is afraid of the dark. Her husband John insists that her fear is irrational and makes plans to cure her. She protests, but he pushes on. What will happen when the lights go out? Relief or something a whole lot worse? This is Michelle Mellon’s first collection of speculative short fiction and she’s already working on a second one. Hopefully HellBound Books will be publishing that one soon, because I really enjoyed reading Down by the Sea! I highly encourage you to grab a copy of this fantastic collection of dark tales that will chill your blood while engaging your brain. Great characters and inventive story lines that change everyday things into shockers. “Fallen Leaves,” “Crash Test Dummy,” and an elderly gardener with a “Green Thumb” are not exactly as they seem. But, that’s what we love about speculative fiction. Five Stars! Don’t miss out! Get Down by the Sea now and support independent writers and presses. You’ll be glad you did!